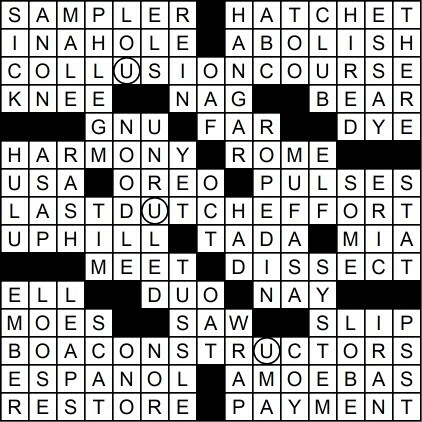 I’ve had COLLUSIONCOURSE kicking around in my head for awhile, so it was good to finally use it in a puzzle. I also like the challenge of having stacked 7’s in the corners but still keeping everything as easy as possible. I wasn’t wild about including PHLEGM (ew) but knew how I wanted to clue KNEE right off the bat. I had fun with the AMOEBAS clue, and started to write a tie-in clue for [Freudian] SLIP but it was pretty awkward so I left it out. I’ve never seen the film version of “Even Cowgirls Get the Blues” but I read the book and really enjoyed it. “Another Roadside Attraction” is probably my favorite Tom Robbins book, though I’ve only read a handful of his stuff. He’s very creative/wacky. A-HA Moment (When I figured out the theme): The second theme entry, “last Dutch effort,” was the theme entry that I filled in first, and right after I figured out the trick with that one, was able to go up to fill in the rest of “collusion course.” The last theme entry, “boa constrictors,” went down without any crossings needed beforehand. O-HO Moment (Something I know now that I didn’t know before): Needed every crossing to fill out SAMPLER, and, even after that, was not too familiar with it. I just finished Googling it and the yellow box is unbelievably familiar, but I definitely had not concentrated on what was written on the box and/or the company that produced the chocolates. Oops! OLIO (Other things of note): Obviously, the clue to KNEE is a topic that is a huge hot button issue at the moment in the USA (35A: [Lee Greenwood’s ”God Bless the ___”]), especially after the protests from a baseball player and numerous football players this past weekend (19A: [Body part to put on the ground in protest, perhaps]). I just encourage everyone to make sure that what has been going on involving that is a way to encourage dialogue about what they are protesting, which is institutionalized racism and the inordinate killings of unarmed people of color at the hands of law enforcement, and what must be done to improve and, eventually, eradicate those ills. Now that I got that out of the way, I can transition to more light-hearted things, like wanting to know what all of the hubbub is with HULU (28D: [Online streaming option]). Though I haven’t cut cable, I know many others who have and they use streaming services like Hulu, Netflix and Amazon, and they haven’t looked back. I’m getting there. Oh, and I definitely got nostalgic seeing the clue to BEAR, as the latter character mentioned in the clue brought me back to one of the cartoons I watched religiously when I was a kid, Disney’s “Tale Spin” (21A: [Fozzie or Baloo, for example]). Who wouldn’t love a cartoon bear who’s jovial and flies a plane for a living? Sportsball moment of the day: Former Major League Baseball outfielder Jermaine DYE (27A: [Easter egg colorant] is a two-time All-Star who was an instrumental part of the Chicago White Sox team that won its first World Series since 1917 during the 2005 season, Dye, who ended his career with 325 home runs and over 1,000 runs batted in (1,072), was the 2005 World Series Most Valuable Player, as he hit .438 in the series against the Houston Astros and drove in the series-clinching run in Chicago’s 1-0 victory in Game 4 to pull off a World Series sweep of Houston. Thank you all for the time, and I’ll see you all next Monday! Congrats and thanks for 19A – how timely! ©2016 PatricksPuzzles.com All rights reserved.